Why Should You Use Bottle Top Dispensers? Bottle Top Dispensers can facilitate a broad range of applications and increase safety, speed and reliability of daily lab work. Choosing a bottle top dispenser saves time, work and protects you and your samples. Let’s see how. Chemicals like acetonitrile used for HPLC and trace analysis are highly corrosive in nature. They can attack different plastic materials and pose a potential health risk if inhaled or on coming in direct contact with skin. Fuming acids are highly concentrated. They are always stored in glass bottles, in a moisture-free environment, to prevent them from getting diluted. Some common examples of fuming acids are conc. nitric acid and conc. hydrochloric acid. Hydrochloric acid is often used in the food industry in the production of gelatine and other food additives or in leather processing. Alkaline solutions such as potassium hydroxide or calcium carbonate are widely used in the production of soaps, pharmaceuticals or cleaning products. These solutions tend to form carbonates when they get in contact with carbon dioxide, leading to crystallization of the solution in storage bottles. In microbiology, reagent tubes are routinely pre-filled with a chemical prior to or after autoclaving. This process is time consuming and typically hindered by tubes that are placed neck to neck in a rack. Often, less than 5 mm space is present in between any two tubes, making it almost impossible to dispense chemicals into each tube without turning and tilting them. And, tilting them can lead to spillage, especially in HPLC analyses, where small glass vials, sometimes pre-filled with aggressive solvents, are used. These vials have a small opening that is difficult to access even with pipettes. A variety of liquids are often sterilized before carrying out an experiment, especially in microbiology or cell culture applications. Working in a bio-safety cabinet demands working with different consumables at a rapid pace and quickly closing the medium bottle after each use, in order to keep the medium sterile. But doing so with glass tubes can prove to be dangerous due to a potential risk of spillage. In microbiology and cell cultures, sterile media are a must and are either prepared directly in the laboratory or bought from suppliers. If the medium is prepared in bottles, autoclaving is the preferred sterilization method. After that, the medium needs to be dispensed into the reagent vessels. This is often accomplished by the usage of serological pipettes and pipette helper. But every time the bottle is opened, the medium is exposed to possible contaminants. Often, the medium is contaminated even before the liquid could be used for experiments, leading to extra time and effort expenditure on autoclaving the contaminated medium and cleaning the bottles. Furthermore, the additional medium needs to be prepared in advance to be sure of having enough sterile medium on the stock. Time and again, it has been noticed that most of the labs do not follow stringent regulatory methods when it comes to carrying out operations involving the chemicals listed above. They find manual ways to perform tasks like pouring, dispensing and transferring, that are definitely simpler but dangerous and in some cases, even fatal. Here’s where‘Bottle Top Dispensers’ or BTDs enter the picture. But what’s a Bottle Top Dispenser, you might ask. In simple terms, a BTD, like its name suggests, is a scientific apparatus, designed to be attached to the top of a bottle and help, generally, in dispensing liquids. A simple BTD consists of a piston on a plunger. This piston is thrust down, and as the spring pushes the piston back into its original position, it draws with itself the liquid/chemical up from a reservoir underneath it. When it is thrust down again, the plunger dispenses the liquid out of the dispenser’s nozzle. Easy and safe to use: Bottle Top Dispensers are easy to use and ensure safety in labs. Each reagent bottle gets its own exclusive dispenser, making the movement of the reagent bottle hassle free. They also provide a closed environment for reagents and eliminate the risk of accidental splashing. Also, as the fumes are controlled, the human body is not exposed to any potential hazard. High accuracy: Bottle Top Dispensers can give an accuracy of about 0.5% – 0.6%. Adding to that, due to a narrow delivery tube, they make dispensing in small containers like test tubes or 1-5ml beakers relatively easy. Facilitate Rapid Work: Bottle Top Dispensers not only facilitate routine and complex lab tasks but also enhance the overall productivity by accelerating the pace of work. E.g., if a high number of samples (50 to 150) need to be prepared in a smooth and error-free manner, BTD’s can easily speed up the workflow along with reduced risk of contamination. 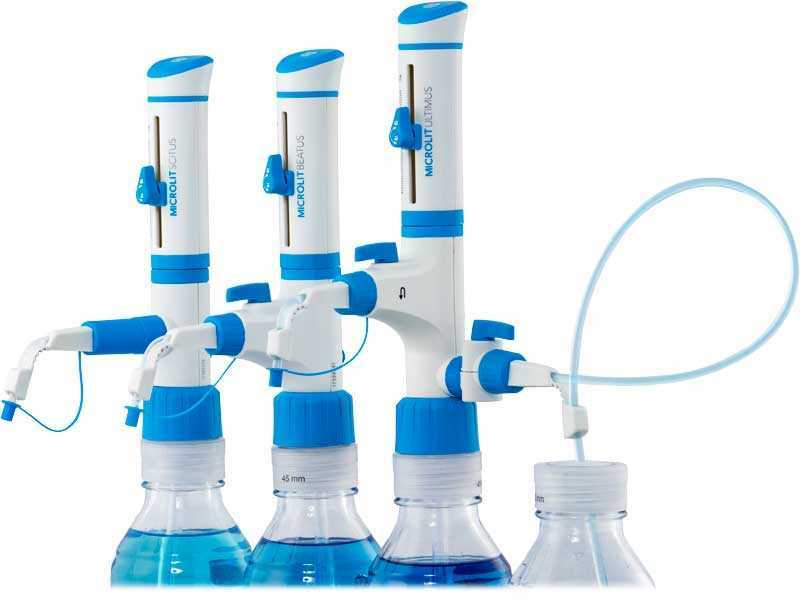 Ensure minimum wastage of reagents: Bottle Top Dispensers come with different adapters to fit almost all kinds of bottles that are used in a typical lab environment. They’re also provided with a telescopic inlet tube, allowing the dispenser to be used with different bottles by adjusting the length of the tube. Thus, they ensure minimum wastage of reagents which is a big concern while using expensive mixtures or solutions. Easy on the environment and the pocket: Since one can directly dispense chemicals/reagents with the help of Bottle Top Dispensers, plastic consumables like tips are not required, thereby preventing unnecessary expenditure and promoting environment safety. Let’s study Bottle Top Dispensers in terms of four actual use cases with high demand for throughput, sterility or those that make use of aggressive chemicals. Bottle Top Dispensers ensure that there is no dripping of chemicals onto a table top which may corrode or come in contact with the skin which may burn severely. In both these cases, the Bottle Top Dispenser is a perfect investment to go for. They can easily keep the bottles containing the fuming acids moisture-free and prevent the alkaline solutions from coming in contact with the air outside. Here too, the Bottle Top Dispensers make the work easy and safe. The pre-filling of tubes becomes a simple task with the dispenser and offers great advantages in terms of filling speed and reproducibility with an extended delivery tube. Using a BTD that can be autoclaved directly with the bottle also eliminates the first source of contamination on repeated opening and closing of the bottle. How do MICROLIT® Bottle Top Dispensers Deliver Precision in Lab? MICROLIT offers three Bottle Top Dispensers designed in-house by an expert team of product design engineers, keeping in mind their usage and applications. All of these feature two product innovations, EasyKnobTM and FlexiNozzleTM that enhance their ease of use and flexibility. Let’s start with the simplest one, concluding with the most sophisticated one. MICROLIT SCITUS offers a simple, cost-effective blend of sophisticated features and functionality. Built by our in-house team of product design engineers, it uses Springless ValveTM, an award winning technology, that ensures smooth functioning. MICROLIT BEATUS is a Bottle Top Dispenser (BTD) built on top of all the features of MICROLIT SCITUS. It uses Springless ValveTM, an award-winning technology, and Recirculation Valve for preventing loss of reagent during purging. MICROLIT ULTIMUS is the most advanced Bottle Top Dispenser that uses Dual InletTM, an award-winning technology patented in India, the EU and the US. It offers 4 liquid handling modes – rinsing, dilution, refilling, purging – without dismounting the dispenser. Decide and choose the ideal MICROLIT® Bottle Top Dispenser to not only facilitate your routine and complex lab tasks but also to enhance your efficiency and productivity.